Support for Students Taking MOOCs The POSTECH is supporting all its students taking MOOCS.● For: Regular graduate and undergraduate students enrolled on the date of MOOC certification.● Amount: Up to￦30,000 per course, and 3 courses per year (Jan. - Dec.)● MOOCs: All courses provided by Coursera and edX(over 2,000 courses)♣ Coursera: www.coursera.org / certificate fee: $49 per course♣ edX: www.edx.org / certificate fee: $25-$99 per course (mostly $50)● Procedure: Certificate fee will be reimbursed upon submission of certificate and receipt twice a year (Jun., Dec.).● E.. Shuttle Service Schedule during Winter The hours of campus shuttle service will be adjusted as follows during the Winter break period. - .. Final Exam Schedule (Only for Undergraduate Students) 1. Period: Dec. 15(Tue. ), 2015∼ Dec. 21(Mon. ), 2015 2. STUDY DAY A. Period: Dec. 11, 2015(Fri.) ~ Dec. 14, 2015(Mon.) B. Eligible students: Undergraduate Freshmen - There is no lecture during the study day period, but the schedule for Reviewing, Problem solving which can help self-study can be arranged. 3. Time Schedule A. General Required, Basic Required: Refer to below Schedule B. Major Course: Depends on Course Schedule C. Please contact with your instructor if you have a time conflict between following schedule and major course..
Fall 2015 Course Evaluation Process Students are encouraged to participate in the Fall 2015 course evaluation during the designated period below. Your active participation and candid responses are highly important as the evaluation results will be used for the improvement of courses. For courses with more than one instructor, each instructor must be evaluated separately. Non-participants will not be allowed to access their course grades, December 15, 2015 - January 17, 2016. 1. Course Evaluation Period: (Tue.) Dec. 1 - (Mon.) Dec. 14, 2015 (two weeks)2. Course Evaluation Procedure: ▶ Onl..
2015 Winter Internship (Graduate Institute of Ferrous Technology, .. If you are interested in winter internship program, please apply for that program with relevant materials.For more details, please refer to ..
"Kim Wook Special Meal Day" Former professor Kwang S. Kim(Dept. of Chemistry) was selected as the National Scientist 2010 and donated his entire cash prize to the university to provide special meals to students. Honoring Prof. Kim's wish, the university has designated the Students Day, which is on November 3rd every year, as the Kim Wook Special Meal Day and will be providing a special meal annually. Details on this year's special meal are as follows. 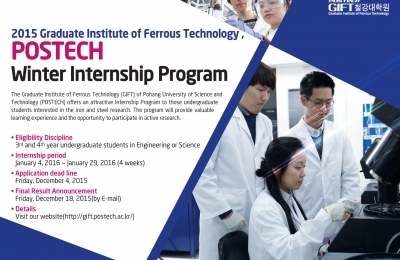 - Date &Time: Tuesday, November 3, 2015 (5:30pm ~ 7:00pm) - Venue: Freedom Cafeteria (Student Dining Hall) at Jigok Community ..
POSTECH Faculty Position Recruitment POSTECH was founded as the first research-oriented university in Korea. 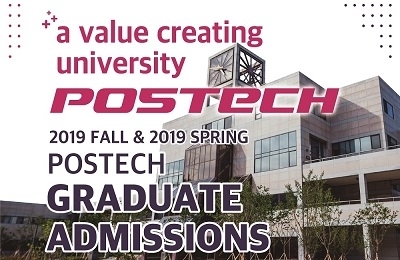 In merely three decades, POSTECH has become one of the world's top universities with unyielding support of the regional community. Through change and innovation POSTECH will once again take its next leap forward. We are currently seeking outstanding scholars for tenure-track or tenured faculty positions as follows. Department Field of Employment Contact Information The Division of Humanities and .. 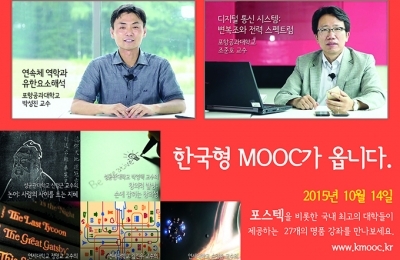 The K-MOOC (Korean Massive Open Online Course) is now fully availa.. The K-MOOC (Korean Massive Open Online Course) is now fully available as seen below.● Course Registration: Oct. 14, 2015 ~● Course Sched..